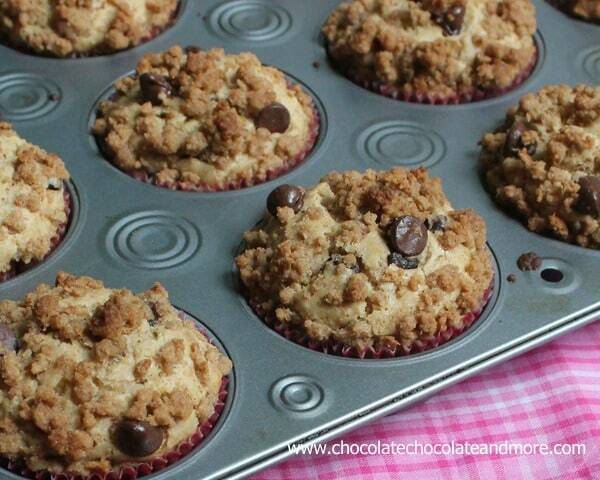 Chocolate Chip Graham Cracker Muffins - Chocolate Chocolate and More! 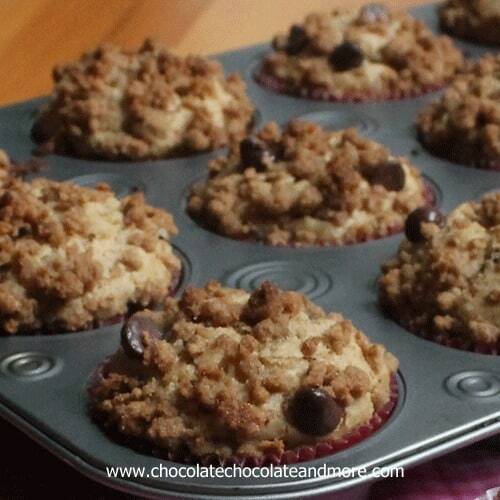 Chocolate Chip Graham Cracker Muffins, so good you’ll think you’re eating a cookie for breakfast! Muffins make a great go-to breakfast in our house. They’re portable. No silverware required. No plate or bowl really, just a napkin if you want to be uncivilized (or maybe lazy and not have to wash any dishes.) We love baking up different varieties and then freezing them. Makes it so easy for everyone to get what they want. 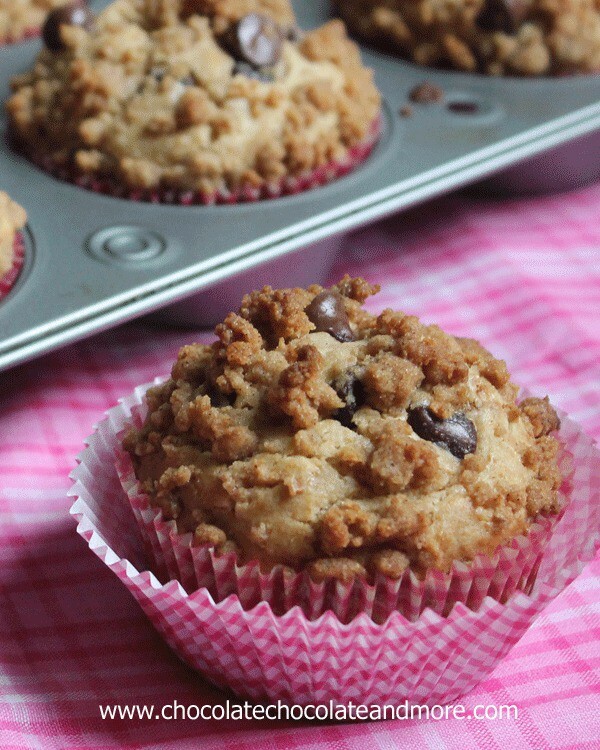 I did a Muffin Round Up from around the web and This Graham Cracker Chocolate Chip Muffin recipe from Michelle’s Tasty Creations has been calling to me ever since. Maybe it’s because the graham cracker is in the muffin but also part of the streusel topping. Like a graham cracker crust but on top. And I love Graham cracker crusts! Maybe because I just look for any excuse to get more chocolate into my breakfast. And hey, there are studies out there that say chocolate can be healthy for you, you I know I’m grasping at straws to justify my craving for these muffins. You have to trust me on this and make up a batch of these muffins. I promise, it won’t be your last one. Unless you can control yourself. Good luck with that! Preheat oven to 400 degrees, grease or line muffin tin with paper liners. Combine topping ingredients until moist and set aside. Combine flour, baking powder, salt, graham crackers and sugar in a large bowl. In a separate bowl, whisk together egg, milk, oil and vanilla. Stir in to dry ingredients. Stir chocolate chips into prepared batter. Place a healthy spoonful of topping on each muffin. Bake for 16-18 minutes, until toothpick inserted in center comes out clean. Let muffins rest for 10 minutes before removing from tin. Mmmmmm……….these look delicious! I love graham crackers and chocolate so these are right up my alley! 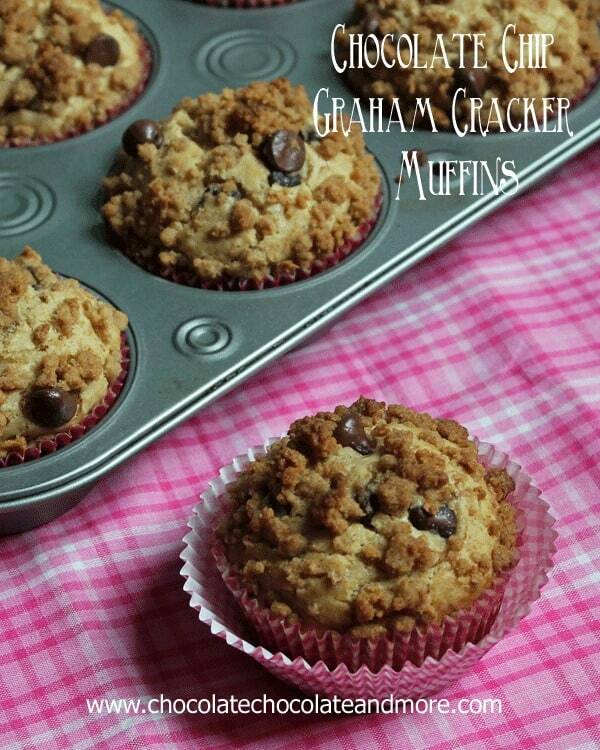 These looks yum…..and I like the idea of adding graham cracker crumbs!!! I have been enjoying your web site and trying some of your recipes lately! Thanks! I don’t know what I’m more excited about, the crumble topping or the chocolate chips! Oh Joan, these look phenomenal! This is such an amazing idea, Joan. 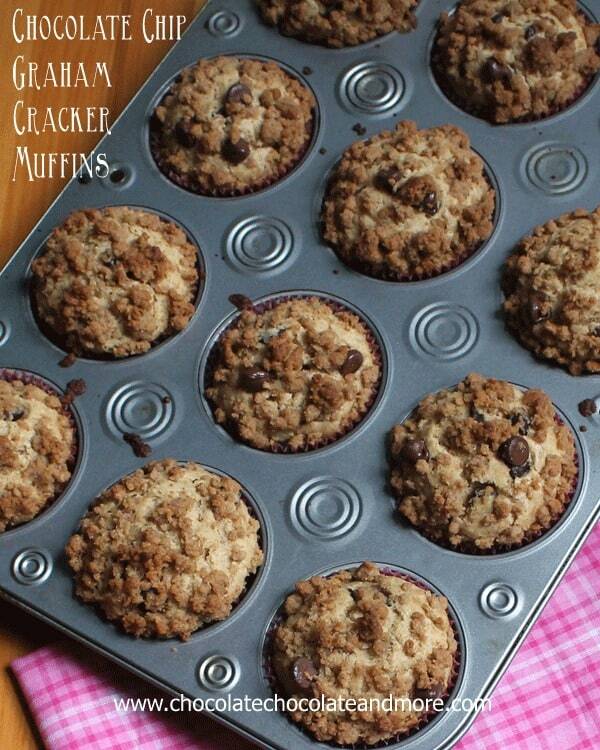 I’d never have thought to put graham crackers into a muffin. Now I want to put it into everything: quick breads, cakes, cupcakes…the sky’s the limit! I LOVE graham cracker crust too, so pinning now! The graham crackers really do make these amaZing Laura, thanks for visiting! Could this be made into a cake,as in a 8×8 or 9×13 pan?? You certainly could. I’d use a 9×13 pan and increase the baking time by 5-8 minutes, just check it with a toothpick to make sure the center is fully cooked, Enjoy! Do I use regular or mini muffin tins? this recipe is for a regular muffin tin. Would these work as mini muffins? How would you recommend adjusting the baking time? They look wonderful! Yes, these would be wonderful as mini muffins! I would start checking them at 10 minutes. I made these muffins the other day and wanted to tell you how wonderful they were. My husband isn’t too much of a muffin fan but he devoured these. Also, as a twist, could I try Nilla wafers in place of the Graham Crackers? Thanks! Of course you can use Nilla wafers, so glad your hubby enjoyed these! Can you use almond milk instead of whole milk? Just made these for work and oh man are they delicious! Absolutely loved them! Going to pin for sure! Thanks for the great recipe! These look amazing!! Going to feature them on my blog. 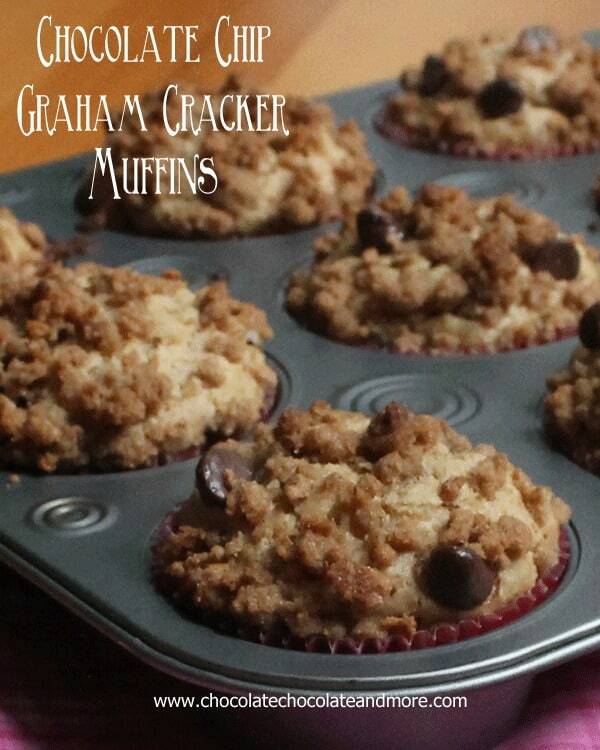 these muffins look sooo good, I was wondering do you think using graham cracker crumbs from a box would be ok to use instead of regular graham crackers? or would they be too fine?- thanks! The crumbs will work fine. You’ll lose some of the texture in the muffin with no larger pieces but otherwise they’ll still taste great. Thanks for sharing this recipe! I loved it and my family loved it too! I agree, they’re perfect for breakfast and for an afternoon snack. Mine yielded 12 muffins, which probably won’t last for 24 hours haha will make up a new batch soon. Glad you enjoyed them. I always make a double batch and freeze half, just so I have some leftover! You want to crush them to small chunks. looks delish! thanks for sharing this recipe.. i can’t wait to bake it for my son and my hubby.. These look amazing! I’m thinking of making them for breakfast tomorrow morning but I was wondering do I have to use whole milk or will 2% be ok? Thanks in advance! Sure you can use 2% milk, I won’t tell! Thank you for replying so quick! I can’t wait to make these! Hello! Can’t wait to try! Would this work in a loaf pan rather than as muffins?! Any variations if so? Thank you! You could certainly make this as a loaf, you’d need to increase the baking time by 5-10 minutes. Use a toothpick to test for doneness. Just made these, very good, but somehow I only ended up with 11 muffins!! As far as I know I just have regular size muffin tins!!! The kids really enjoyed them, will def keep this recipe and make again!